The Horn Reborn in St Albans at the corner of Alma Road and Victoria Street is the closest pub to the City station. It looks a bit rough from the outside but it's smarter on the inside. At the time of the review the service was rather slow and the pint of Green King IPA, the only real ale sold, was of poor quality. There's a games room at the back with pool, bar football and a juke box. A strange large sculpture is attached to the wall in this room. As the games room backs on to the stage it can get very noisy when the bands are practicing or playing. 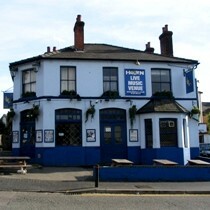 The Horn Reborn has live bands playing most nights in a separate room to the side of the pub. Entrance fee to see the bands can cost between £6 and £12. When bands are playing you may need to pay this fee to enter the pub, even if you don't wish to see the band. Now serving Brakspear real ale which tasted okay.